Axios is the exclusive coverage partner for Nielsen’s annual Consumer 360 Summit today and tomorrow in Washington, D.C. Speakers include marketing and advertising executives from Facebook, Snapchat, CBS and more. Look for Sara Fischer's coverage throughout the day in the Axios stream for all-day coverage of the event. "That complexity doesn’t translate well on a bumper sticker," says Dean Garfield, head of Information Technology Industry, a trade group representing U.S. and global tech companies. "There is no doubt there are legitimate concerns — both national security and economic — related to China," Garfield said. 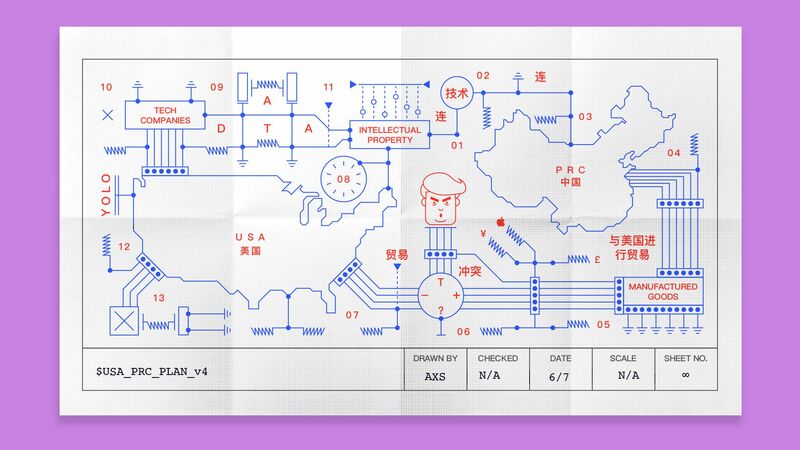 "The thing that we in the tech sector try to avoid is being reductionist in assuming simply because it is China that it is bad. That is simply not the case." "The core issue is that both nations want to dominate a sector defined by network effects," Mehlman told Axios. "The best innovators leverage bigger data sets, larger consumer bases, global customers, while the most aggressive nationalists aim to box-out others’ products and people." Speaking of China, Commerce Secretary Wilbur Ross told CNBC this morning that U.S. negotiators have "executed a definitive agreement with ZTE," including a new $1 billion fine and 10 years of compliance monitoring. Quick take: The compromise with ZTE — a repeat violator of U.S. sanctions against Iran and North Korea and a company identified as a national security threat by the Pentagon — could set a dangerous precedent for trade negotiations with China. But the Trump administration's speedy deal allowing ZTE to keep manufacturing also highlights just how tough it has become to disentangle America's tech interests from China's. Just how dominant are Apple and Samsung in the global smartphone business? Well, for the first three months of the year, the top 10 phones all came from one of those firms, according to IHS Markit. The bottom line, per IHS Markit: Apple and Samsung not only dominate the list of the best-selling models, but the two firms also account for nearly all the industry's profits, with the combined rest of the industry struggling to break even. 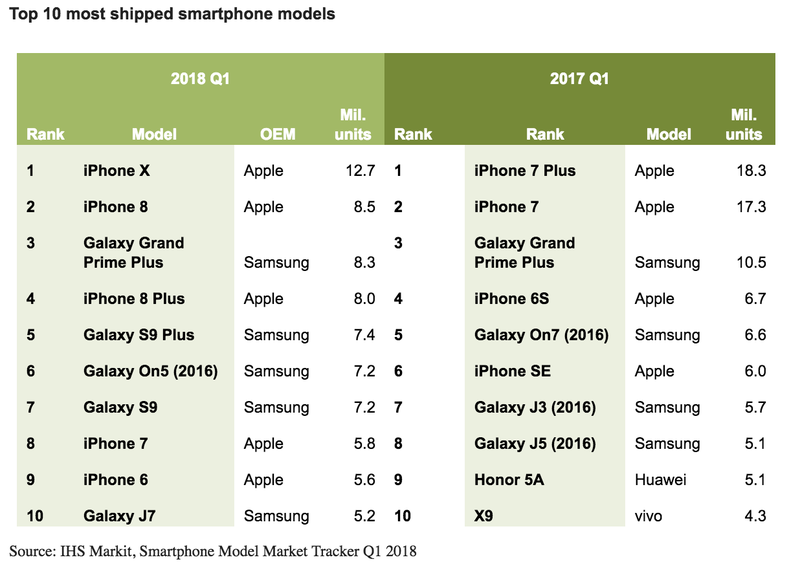 Apple's iPhone X was the top selling model for the quarter, followed by the iPhone 8. In third, and ahead of the Galaxy S9 and S9+, was a Samsung phone that most people in the U.S. probably haven't heard of: The Galaxy Grand Prime Plus. It's a big-screen, but low-end smartphone that dates back to November 2016. While Apple held the top two spots, as it has for a while, those phones accounted for less of the market than in past years. “Although Apple’s newest model shipment volume declined, the company announced good earnings in the first quarter, mainly because of price increases in the iPhone 8 series and the super-premium price of the iPhone X,” said Jusy Hong, director of consumer devices for IHS Markit. "Major local monopolies will be told it is fair to discriminate, and we should not be surprised if, not overnight but over time, we begin to see internet services discriminate in a way that benefits their bottom line rather than the diversity of choices available to consumers and the opportunities available to innovators." Separately: Wheeler also weighed in on the messy dispute over whether cyberattacks slowed comments on the FCC site during net neutrality debates in 2014 and 2017. David writes more on this here. Many Silicon Valley leaders believe they've created a meritocracy that's working just fine. Progressive critics and people in groups who feel they've been excluded see it as fundamentally broken. Our thought bubble: It's rare to see these two perspectives face off head to head, civilly, in a public forum. But, as Axios' Scott Rosenberg observes, that's pretty much what happened at an Oakland event last Friday. The details: Prominent tech investor Jason Calacanis walked back some controversial comments about bias in tech — and unintentionally offered an inventory of the industry's persistent blind spots on diversity and inclusion. Calacanis made clear that he has changed the perspective he had embraced for years in provocative tweets, and now accepts the view that there are real problems with exclusion in the industry. He won applause for that. Yes, but: Then he evoked cringes as his conversation displayed a set of stereotypical "arrogant tech dude" traits. Go deeper: Scott describes what happened here. Why it matters: While never a sure indication of any forthcoming products, patent filings can show where the interest of companies lie, and these add to the idea that Apple is putting a lot of energy into the health arena. Apple's WWDC wraps up in San Jose. TCL, which has a license to make BlackBerry brand phones, is launching its latest device in New York. Details on the Key2 have leaked widely ahead of the event. Ben Elowitz, former CEO of WetPaint and co-founder of Blue Nile, will be managing director of startup studio Madrona Venture Labs. "The startup scene in Seattle has just been exploding," Elowitz said, noting the impact of Big Tech establishing Seattle operations in recent years. One particular area of focus will be on taking machine learning technologies and applying them to various industries. Former Qualcomm CEO Paul Jacobs, who is still weighing a bid for that company, launched a new venture, XCOM, that also includes former Qualcomm president Derek Aberle. Magic Leap shared a bit more about its secretive augmented reality headset via a webcast to developers, per CNET. Sonos introduced the Beam, a $399 Alexa-powered soundbar, The Verge writes. USA Today reports that AT&T has dropped a policy that kept some of its phone rivals from advertising on DirecTV. Microsoft has started deploying its latest Project Natick undersea data centers, per Quartz. Google released a second beta version of Android P, including new emoji designs and final versions of the programming interfaces being made available to developers. AppA11y, which specializes in video games for those with visual impairments, acquired Pangia Games. The March 22 ransomware attack on Atlanta, Georgia, could cost the city an additional $9.5 million in recovery funds, Reuters reports. Check out this Kickstarter effort to create a cookbook specifically for those dealing with the taste change that often comes with chemotherapy.